This circa 1915 postcard shows the Masonic Temple at the northwest corner of 18th Street and Fifth Avenue that had been built only two years earlier. It looks the same today, with the only apparent changes being an added fire escape and a new lighted sign hung at the corner. The dream of this new home began at a 1907 meeting of four Masonic organizations: Trio #57 Ancient Free and Accepted Masons (AF & AM); Commandery #18 Knights Templar; Lodge 658 AF & AM; and Chapter #18 Royal Arch Masons. The Trio group was the oldest, organized here 1848. Its name refers to the three towns of Rock Island, Moline and Camden Mills, as Milan was then known. Freemasonry has its roots in the English guilds of stonemasons who built cathedrals in the Middle Ages. These masons organized in the 17th and 18th Centuries to teach members their trade as well as to impart moral guidance. As the demand for builders decreased, the guilds began to accept those who were not stonemasons as members. Today, Masons use ancient rites and trappings to promote brotherly love, relief and truth, using allegory and tools of the old stonemasons. Masonic organizations are not strictly for men. There are orders for other family members, including Eastern Star for women, DeMolay and Builders for boys, and Job’s Daughters and Rainbow for girls. Since 1875, the Masonic Temple had been located on the third floor of a bank building on 18th Street at Second Avenue. The site for their new building would be a few blocks south on 18th Street where a stair factory had previously operated. That land was purchased by the Masons for $5600 in 1909. With the lot acquired, fundraising began in earnest. In an intense effort, $57,000 — $7,000 more than the goal – was raised in only six days. John Volk, prominent local contractor – and also a Mason – was awarded the $75,000 construction contract on August 16, 1912. A thousand Masons from all over the county attended the laying of the cornerstone on October 17 and 500 of them continued in a parade. The front door frame, already been set in place, was decorated with autumn leaves for the occasion. 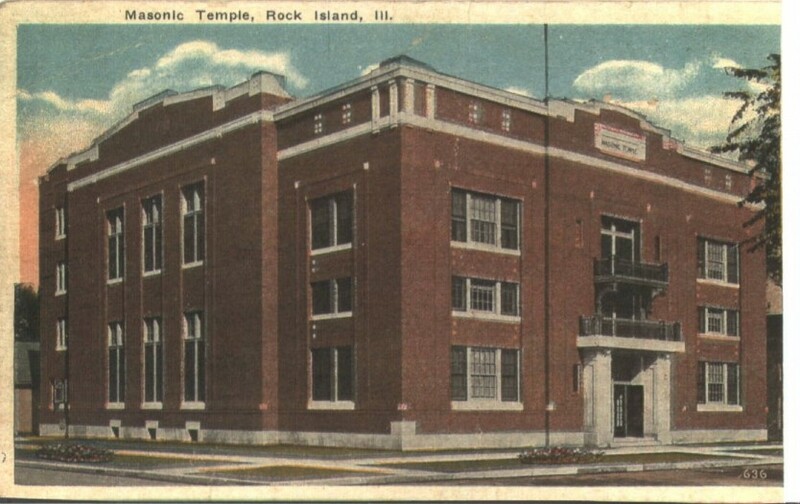 Contents of the cornerstone included bylaws and rosters of the several Masonic organizations as well as local newspapers of the day – including John Looney’s Rock Island News. The year-end edition of the Argus for 1912 shows an architect’s drawing, the work of Olof Cervin, of a slightly different version of the building. The foundation depicted is heavily textured stone, while wide borders of masonry frame groups of windows. These details were changed during construction, as both the 1913 year-end Argus and this postcard show the completed building looking as it does now. In early 1922, the Masons purchased a 40-foot wide residential lot to the north of their building. They announced their intent to build a 50-foot wide addition that would accommodate a clubroom, kitchen, dining room, and lodge. Since the addition would cover an existing driveway on the north, a new west driveway was also planned. The architectural firm of Cervin & Horn was retained for the design. The entire job would cost $60,000 including the $5,500 purchase of the lot. Once the addition was finished, the building was estimated to be worth of $300,000. However no construction ever occurred, either of the building or the driveway. Much later, in 1950, the Argus reported that a former attic storage area was nearly finished being converted to a 20 x 60 foot lodge room. The new room included indirect lighting, air conditioning and custom-built furnishings. A few years earlier, an anniversary booklet noted that three additional lots had been acquired since 1918, with the most recent being the “Patton property” to the west, purchased in 1948. A step into the Masonic Temple is a step back in time. Fortunately, the opportunity often arises for the public to take that step. The beautifully preserved interior spaces were used not only by the Masonic organizations, but were available to the community as well. Such use has a long history. The archives of the Rock Island County Historical Society contain a $25 receipt issued to John Hauberg, representing the Anti Saloon League, for the rental of the banquet hall, parlor and kitchen. This article by Diane Oestreich is slightly modified from the original, which appeared in the Rock Island Argus and Moline Dispatch on October 5, 2003.